From 16.1.0.24 to 16.2.0.50 version of Essential Studio release, the PDF viewer control provides a robust rendering of PDF document using the Pdfium rendering engine. Refer to the following steps to use Pdfium rendering in Syncfusion PDF viewer. Note: The Pdfium folder will contain two folders namely X86 and X64, both contains pdfium.dll assembly for the respective architecture. The Syncfusion PDF viewer is designed to detect the architecture of the target machine in which it is deployed, and pick the corresponding pdfium.dll to use it. Then, the ReferencePath property of PDF viewer should be set to locate the “Pdfium” folder. 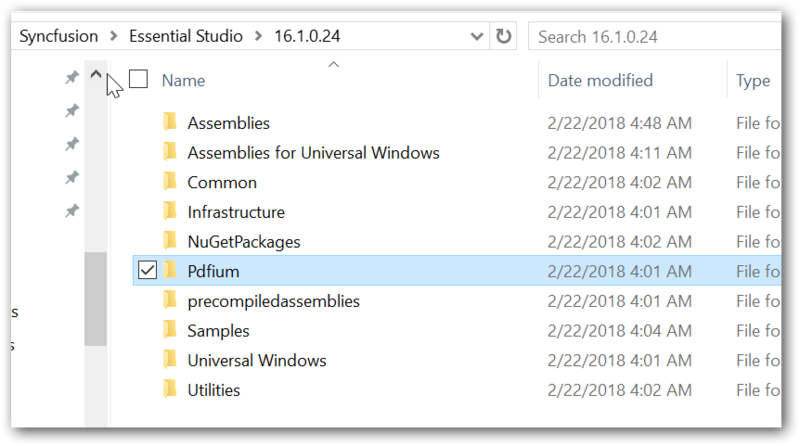 Note: From 16.3 (2018 volume 3) version of Essential Studio release, “Pdfium” library is embedded with the PDF viewer control. So, it is not necessary to set the reference path to PDF viewer and the default rendering engine of the PDF viewer is made by Pdfium.